Commencement is a special time to celebrate for students, friends, family members and the college community. Share your photos, congratulatory messages, well wishes and excitement on social media using #WildcatsGrad15. Cazenovia College also has the following social media activities planned for Commencement. Don’t miss the #WildcatsGrad15 photo frame that will be hung outside the Dining Hall the day of Commencement for students, families and friends to share their special moment! 'like' the Cazenovia College Alumni Facebook page. The winner will be announced at Commencement rehearsal on May 15, 2015. 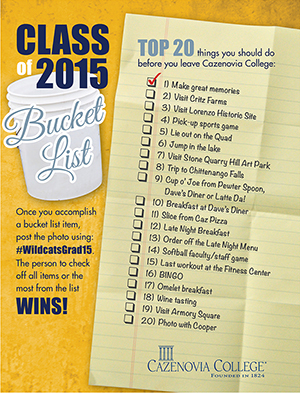 Print the Class of 2015 Bucket List (pdf) of the Top 20 things you should do before leaving Caz College. *Once you complete an item off the list, tag your photo using #WildcatsGrad15 on Instagram, Facebook or Twitter. We’ll share our favorites throughout the week! The first person to check off all items, or the person who checks off the most items, from the list WINS a Bookstore gift card! For complete Commencement details, visit www.cazenovia.edu/commencement.